The beautiful sunny weather we’ve had over the past week or two has been fantastic for orchids and we’ve had lots of great photographs uploaded to the site. You can view and classify the uploaded photos by clicking on Identify. Great weather also makes for fabulous public events and we’ve been attending or organising a number of events where the Orchid Observers team have been talking about the project and encouraging people to get involved. On the first bank holiday weekend in May we attended the Lyme Regis Fossil Festival (more about that in a later post) and yesterday was the third International Fascination of Plants Day where we showcased botanical specimens and projects all over the Natural History Museum. This Saturday 23rd May is one of our biggest events of the year – Big Nature Day. 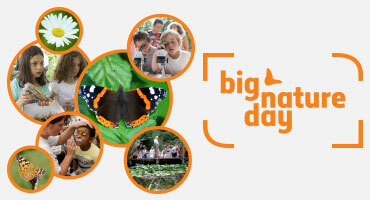 Big Nature Day is a celebration of the diversity of life in the UK and we have 40 different nature groups and wildlife recording schemes coming to the Museum to showcase their work and talk about the groups of organisms they study. In marquees in the Museum’s Darwin Centre courtyard and Wildlife Garden, groups will have stands and activities suitable for families and it’s a great opportunity for nature-loving adults to meet like-minded people. It’s the Museum’s annual celebration of the variety of nature, in recognition of the UN International Day of Biological Diversity. The event is free to attend, so come along and meet naturalists from across the UK. The Orchid Observers team will be there with a display of orchids from the museum’s collections, so you can see some of the specimens you’ve been working on and find out more about the project.